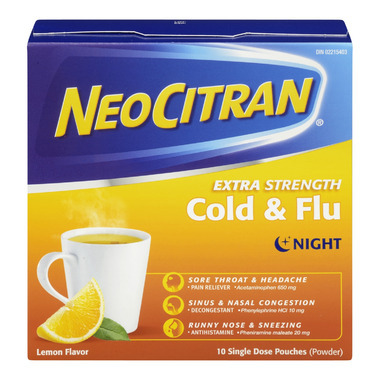 The most popular formula of NeoCitran, with even stronger pain relief than their original Cold & Flu Product. Dosage: Dissolve the contents of 1 pouch into 225 mL (one cup) of boiling water. May be taken every 4-6 hours. Do not exceed a maximum of 4 doses per day. Children under 12: Do not use. Non-medicinal Ingredients: Acesulfame K, citric acid, D&C Yellow No. 10, FD&C Yellow No. 6, flavours, maltodextrin, silicon dioxide, sodium citrate, sucrose, tribasic calcium phosphate. Love this stuff! Always helps me get a good nights rest when Iâ€™m sick.